According to Central Pollution Control Board (CPCB), the Air Quality Index at 9 a.m was 213 which prominent pollutant particles being PM 2.5 and PM 10. 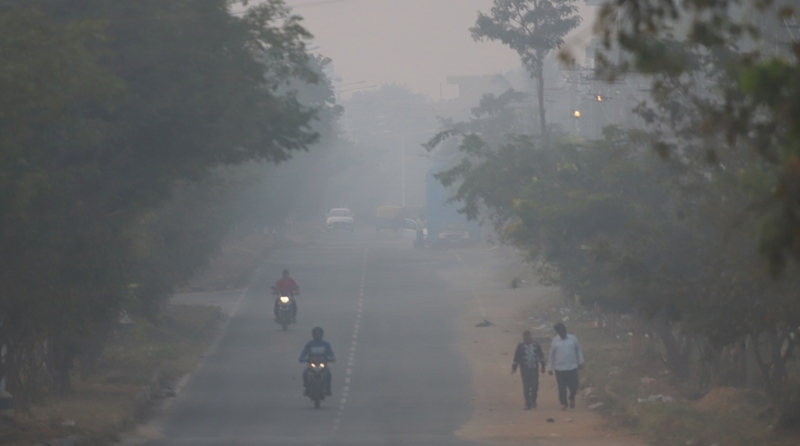 Residents in the national capital woke up to a misty morning on Tuesday as the minimum temperature settled for 6 degreeS Celsius, a notch below the season’s average. “It was cloudy in the morning along with mist. There will be haze and smog later in the day with no chances of rainfall,” an India Meteorological Department (IMD) official said. According to the IMD, the cold wave situation is going to continue for the day owing to which the maximum temperature in Delhi is likely to hover around 19.5 degrees Celsius, a notch below the season’s average, while the minimum may settle at 5 degrees. However, there was improvement in the air quality as the quality index improved to ‘poor’ from ‘very poor’ on Monday. At least 13 trains headed towards the national capital were delayed due to fog. On Monday, the minimum settled at 8 degrees Celsius, a notch above the season’s average.